Bible scholar Dr Jim McClure cuts through the jargon so beloved by theologians enabling readers to rediscover the profound significance of the unavoidability of grace in salvation and in living the Christian life. Grace Revisited takes us on a journey back to ancient Greece to unearth the origins of the word and concept of the Greek word charis. With scholarly precision, this easy-to-read book shows that the commonly accepted definition of grace as ‘The unmerited favour of God’ falls short when applied to the New Testament. Featuring a drunken American journalist, a Palestinian terrorist and an Irish double agent, much of this gripping fast paced novel about terror, betrayal and redemption is set in Gaza. Each of the characters find redemption in their twisted lives but not before much mayhem has been committed and the world has stood on the edge of complete disaster. You are a young and poor girl in love, living in Nazareth, looking forward to marriage, when suddenly your life is changed forever when you are told that you are to become the mother of the greatest person in history, the Messiah – Jesus Christ, and yet you are a virgin. This novel by veteran author, broadcaster, and journalist, Dan Wooding, tells the amazing story of Mary, and gives real insights into her life with her beloved son, from his childhood, his growing years, his ministry, his terrible death upon the cross, which she witnessed, his resurrection, and finally, his ascension to sit at the right hand of his Father in heaven. It is an epic story, based on the Bible, about an extraordinary mother who was described by God as ‘highly favoured’ among women. Young Soon has one desire– she wants to hear her children laugh. A widow, pregnant with her third child, Young Soon cooks grass soup just to survive. The town loud speaker, her only news source, brags daily that her beloved North Korea is prospering while the rest of the world is starving. She is shocked when her brother, a soldier, informs her that millions in North Korea are starving. A smuggled newspaper reveals there is food just over the border in China. 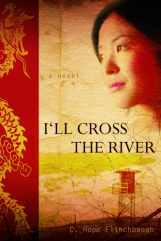 Will Young Soon be forced to abandon her communist beliefs and risk her life and the lives of her children to cross the guarded Tumen River? Inside China, 21-year-old Mei Lin (the lead character in the author’s previous two novels, Daughter of China and Across the China Sky) launches her first missionary tour. While on a journey of miracles, she has a heart-pounding dream of a baby crying out to her from murky waters. Who is this baby? How will she find him?